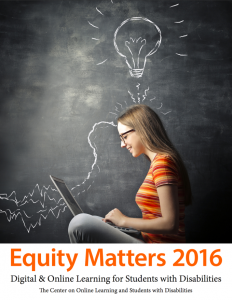 The Center on Online Learning for Students with Disabilities (COLSD) has released the 2016 version of its annual publication Equity Matters: Digital and Online Learning for Students with Disabilities. This year’s publication focuses on promising practices for addressing the needs of students with disabilities in full-time virtual, blended, and supplemental online settings. The publication summarizes state and territorial policies related to students with disabilities, research on students with disabilities in online settings, the shifting roles of parents and teachers in K-12 virtual education, and state educational agency responsibilities. Chapter 1 provides an introduction to the 2016 annual publication. The chapter provides an overview of the publication and key terms and definitions used throughout the chapters. Chapter 2 consists of U.S. state and territorial policy scans regarding each of the 50 states and five territories. The content summarizes their online education policies related to the implementation of the Individuals with Disabilities Act (IDEA) for students with disabilities. The state scan highlights the need for informed policy decisions at the state and local level. Chapter 3 discusses recent research on curriculum considerations, pedagogical strategies, and other service considerations for students with disabilities in online environments; and the preparation of teachers for the online instruction of students with disabilities. Chapter 4 discusses the shifting roles among professionals and parents within online learning environments. The chapter also covers the social experience of students in online education. Chapter 5 discusses the responsibilities of local and state educational agencies in serving students with disabilities in online learning settings. Chapter 6 reviews key ideas addressed throughout the publication. In light of these key ideas, persistent challenges and opportunities are discussed. Finally, five lingering questions designed to address critical issues are provided for stakeholders to consider when developing policy and training programs for the digital learning environment.